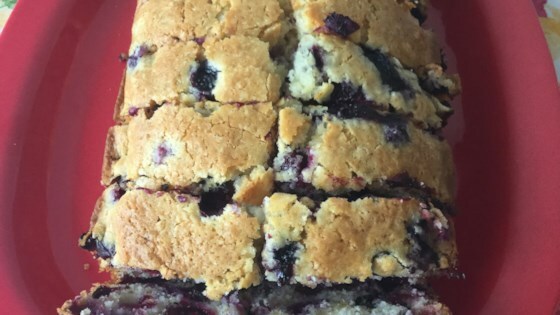 "An easy-to-make, delicious blueberry loaf that works equally well with fresh or frozen blueberries." Mix flour, sugar, baking powder, and salt in a large bowl. Stir milk, oil, egg, and vanilla extract into flour mixture until batter is just blended. Gently fold blueberries into batter; pour into prepared loaf pan. Bake in the preheated oven until a toothpick inserted into the center comes out clean, 60 to 70 minutes. This loaf was out of this world! It was the quickest, easiest breakfast bread I've ever made.. even the cleanup was minimal. I used canned bing cherries instead of blueberries. This is so delicious! Both my boyfriend and I couldn't stop eating it. Perfect moist, almost cake like consistency. Frozen berries worked great. Definitely recommend it.